This is long past due as I have been itching to share with you the vitamin and whole food supplements I take and the awesome results I experienced at the beginning of Summer when I added a few to my regiment. As many of you know, I have been taking Juice Plus Orchard, Garden and Vineyard blend for over two years now and this has enabled me to get extra doses of fruit, vegetables and grains into my diet. These have enabled my body to remain in a minor detox mode. It helps to cleanse my body of the exposure to toxins via the food or chemicals I am exposed to. I take Juice Plus instead of spending mass quantities of time juicing and cleaning up; however, I still eat loads of vegetables and fruit in my diet via salads, smoothies, sandwiches or any other creative way I can implement them into my day. For the first two years I took twice the adult dosage of Juice Plus. I am currently taking one adult dose a day. I take vitamin B12 because it plays a key role in the generation of myelin. Many people are B12 deficient but M.S. patients are almost always deficient. I currently take 2,500 mcg Sublingual every other day. Vitamin D is also found to be deficient in many M.S. Patients. I try to get in the sun at least 15 minutes a day to soak in the rays but if it is too hot or too cold I increase my Vitamin D. I currently take a cheaper brand of Vitamin D3 2,000IU. I will soon be investing in a higher quality product as the one I am taking now has an artificial caramel color added to it. I did not catch that before buying it. This is why it is very important to read labels. If you don’t know what an ingredient is look it up and make sure it is good for your cells! Our family moved to a new city at the end of April and we quickly jumped into extracurricular activities, casual home school and adjustment to a new routine. It seems that inflammation in my body and exacerbation of symptoms always kicks up an extra notch during the Spring months and then a whole other side of symptoms are experienced with Summer heat. As the May flowers began blooming so did the inflammation within my body. I began experiencing a lot of numbing in my feet and legs. I had the padded feeling on my feet and the numbing began moving its way up my body. Concern kicked in that I would have to go the hospital again. Fear that doctor would damage my body further with intravenous steroids was on the rise. It was then that I was reminded by a fellow M.S. patient about a product called Protandim. A stranger had told me about it and I had written the name down and forgot about it. I quickly looked up the main ingredients and ordered a few of them of Amazon. The five main ingredients in Protandim are: Milk Thistle (225mg), Bacopa extract (150 mg), Ashwagandha root (150 mg), Green Tea (75 mg) and Turmeric Curcumin extract (75 mg). I began taking Green Tea capsules but my eye began to twitch within the first few days and it was driving me nuts so I stopped taking it after a week or so. I do drink decaf and/or caffeinated Green Tea regularly. It helps me to be alert when driving, writing to you fine people 😉 or whatever else I need to be extra alert. It is also full of antioxidants and helps to decrease inflammation in the body. I might start taking it again to see if it was this supplement that relaxed me too much or not. It is very, very good for the body and worth the effort in trying it again or taking it with a light snack before bed. I currently have 570 mg capsules of Full Spectrum Ashawagandha. At the same time I started the Ashwagandha and Green Tea I started taking two 1,000 mg capsules of Turmeric Curcumin and 1 150 ml of Milk Thistle a day. Turmeric Curcumin has tons of antioxidants in it and in turn enables the body to decrease inflammation. I bought these on Amazon.com and was very impressed with the Eden Pond brand.. On the box I received I was given an opportunity to receive a free bottle. I contacted the company and after submitting a review I was sent a whole bottle for free! So awesome! As the week or two went by I wasn’t even paying attention to my body. I was in Mama’s busy mode and unaware of the changes taking place. It wasn’t until my mom asked if there had been any changes that I realized the numbing had gone away. Completely gone. We were in the midst of hot weather but the numbing was gone! Now, let’s be real. I do still have symptoms. At certain times of the month I have an increase in weakness or nerve craziness. I wake up with an arm that feels dead and I hurry to awaken it. Certain body functions are not normal but for the most part I am doing amazing! 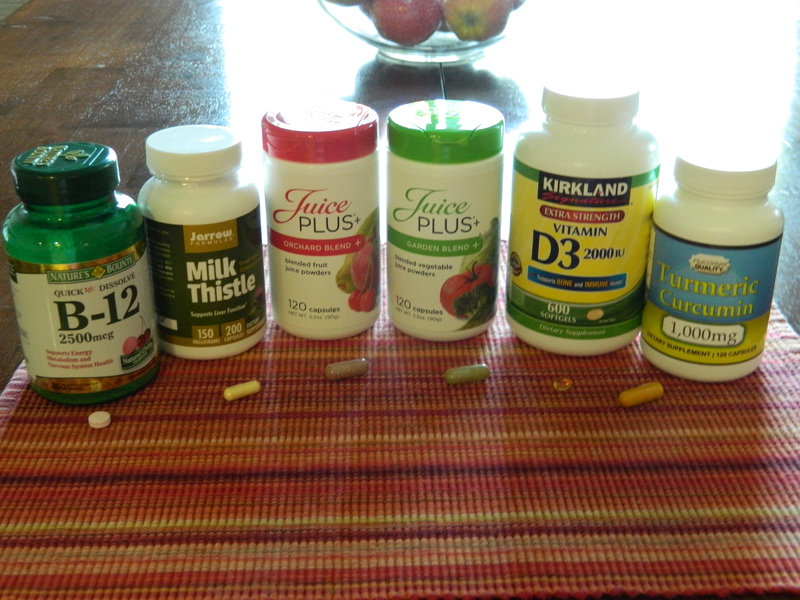 Due to my diet, the Juice Plus, the supplements and regularly working out I am moving and functioning almost normal. I have worked my way to riding on average seven miles in twenty minutes or less on my stationary bike. I do whatever I can each day to stay active. Some days I do lots of stretching and Yoga/Taekwando/Pilates type poses and I lift light weights. The next God given gifts of herbs I will be trying is Essential Oils. I have been using a cheaper grade of oils here and there and have found some results. I will be getting my first shipment of pure, high quality Young Living Essential Oils tomorrow and I can’t wait to implement them into our family’s daily routine. I will let you know what I experience. Glory be to God for leading our family down this road of natural healing. We are pressing on as a family towards a better quality of life. I am not striving to live a long life but a life well lived. Please let me know if you have any questions regarding these supplements or companies. I would love to help you in whatever way I can. I am not a trained naturopath or physician. I am only sharing my personal experience and the results I have experienced. I am praying for you today. I love reading your blogs Charise. You are a strong momma. You are just as amazing person now as you were when we were younger, I love you friend.